Tyme Marsters started playing in Westport when he was 10 years old. In 1993 Tyme moved to Christchurch to join the New Zealand Army Band after a 3 month Army Recruit Training Course. Tyme also joined Skellerup Woolston Band where he played for 9 years. 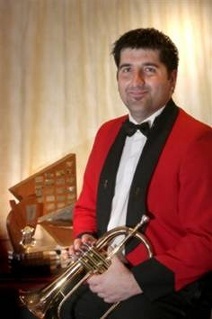 Tyme’s success as a soloist includes winning the New Zealand Open Amateur Cornet Solo in his first year in the Open Section in 1995, also being awarded the Pat Cole Medal for Youngest Winning Open Soloist at the National Championships. Last year Tyme won the New Zealand Open Flugel Horn Championship and went on to win the coveted Champion of Champions of New Zealand. Tyme was a member of the National Youth Band of New Zealand in 1998 & 1999. Tyme was also a member of the National Band of New Zealand that toured the United States of America and New Zealand in 1995, tour of Europe in 2005, tour of New Zealand in 2007 with guest soloist James Morrison, was part of the National Band’s CD recording in 2008 & recently this year in July competed at the World Brass Band Championships in Kerkrade Holland. Tyme has been very fortunate with his travels both with military and civilian groups. Some of his highlights have been tours to Italy and Switzerland for the Festival of Music, UK and Europe for 5 months as an Defence Force Exchange Musician and the All England Masters International Championship in Cambridge in 2006, Italy for the 60th Anniversary of Monte Cassino as the New Zealand Defence Force Bugler in 2004, two tours to Edinburgh Military Tattoo in 2002 & 2006, UK to the British Open in 2000 and to Washington DC for the Unveiling of the Korean War Memorial in 1995. Tyme has a wide range of experience in many musical genres. Tyme has played Lead Trumpet with the All Stars Big Band backing the likes of Tim Beverage, Glen Shorrock (From Little River Band) and James Morrison. Tyme has also played in many show productions, some of which are Brassed Off on Flugel and Solo Cornet and Romeo and Juliet, Witches of Eastwick on Trumpet. Tyme also recorded The Producers and La Cage Aux Folles Productions playing all Trumpets Parts. Tyme currently holds the position of Deputy Bandmaster and Performance IC of the New Zealand Army Band & also recently newly appointed Musical Director of New Zealand’s A Grade Band Canterbury Brass.